Check out the video recording of the NSX-T automation using Concourse presented at Las Vegas, VM World Aug 2018. Video walks through the nsx-t-gen pipeline and a real time install of NSX-T, all achieved within 20 minutes of the presentation. I had been working and supporting a set of tools aimed at easing and automating install and use of VMware's NSX-T SDN product with Pivotal's PAS (Pivotal Application Service) and PKS (Pivotal Container Service - k8s offering) product versions on vSphere platforms. I wanted to share the evolution of these tools and how they work together. nsx-t-gen is a toolkit that helps automate the install of VMware NSX-T SDN product on vSphere platform. It uses Concourse pipelines to make a set of tasks easy and automated while keeping the various pieces together towards the objective of fully automation of NSX-T. User supplied params for vCenter, networks, credentials etc. NSX-T Mgmt and runtime configuration for Edges, Mgr, Ctrl along with routers/switches, ip blocks, pools, nat rules, security group etc. The end result is a fully installed NSX-T Mgmt plane running on a managed cluster (with edges) while using single or multiple compute clusters as transport nodes. Various Cloud native product offerings (like PAS or PKS or others) can be installed and managed on top of this NSX-T managed network infrastructure. All of these pipelines use similar set of pipeline parameters and tasks while abstracting the version dependencies from the end user to provide the same zero-touch install experience. Installing PKS tile (v1.0, 1.1.x, and most recent v1.2) with NSX-T enablement, auto-configuring the PKS Super User creds to be used against NSX-T. Handle dynamic integration of PAS components with Load balancer (like GoRouter or TcpRouter or Diego Brains) using security group association with the related job groups and using pre-configured server groups tied to security group for membership (handled by nsx-t-gen pipeline), compared to old way of using static IPs for job types and associating them with the Load Balancer server pool membership. Automatically configuring NAT rules to allow the PKS API Controller to be reachable externally. Install Harbor Tile and automatically configure NAT rules to expose Harbor outside. One of the challenges most customers or field people face relates to installing these products in completely offline or isolated environments (no online access to any external resource). The Concourse pipelines implicitly assume an online, interconnected setup to pull down various resources, github repos and docker images that are internally used as part of a task definition. This makes the whole isolated, offline working model break it. I helped build a model of a pipeline that was aimed at truly offline pipeline execution to install NSX-T and PKS (Pivotal Container Service) in such limited restricted environments. The outcome was canned-pks. All of the above mentioned bits are downloaded and saved using scripts. 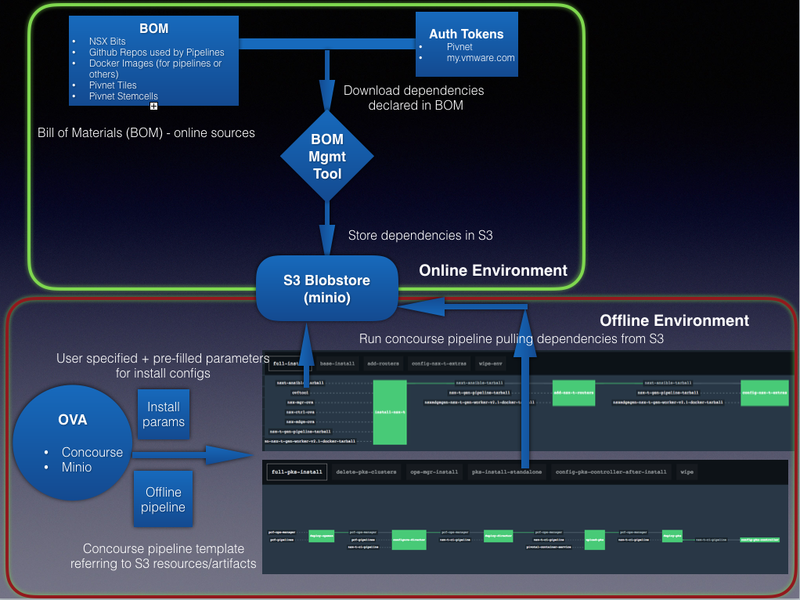 Run the offline equivalent of the pipeline bundled in the canned-pks repo against the saved resources. The pipeline extracts them into a form that can then be used to execute the actual steps that installs the product, without requiring any online access. The complete steps are detailed in the canned-pks repo. It supports an opinionated install view of NSX-T (single compute cluster vs arbitrary # of compute clusters supported in base nsx-t-gen pipeline and certain precooked configs) to achieve a fast, simple and easy install of NSX-T with PKS in offline environments. 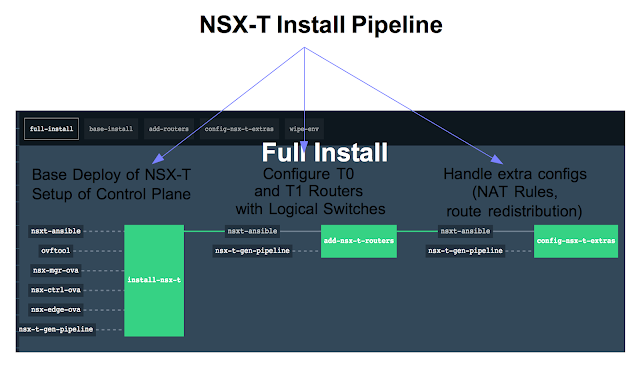 Also, I am happy to announce that the nsx-t-gen pipeline codebase has now been adopted by VMware and would be maintained going forward in form of their nsx-t-datacenter-ci-pipelines repo. All of these tools should help users get an more easier and faster ramp up experience with NSX-T and PAS/PKS product stack. Just a note of caution: All of the above tools are not officially supported but free to use at user's own discretion and risk. With Oracle announcing end of free support for past versions of Java, more users are expected to use OpenJDK and I believe its very useful for ThreadLogic to support OpenJDK thread dumps. With that in mind, ThreadLogic version 2.5.2 now supports parsing OpenJDK thread dumps along with some additional thread group (Tomcat, Datastax etc.) classification. For people new to ThreadLogic, they can check the older posts on the need for such a tool and its usage in analyzing thread dumps. Feedback welcome on the tool.